ENGINEERING. PRACTICE. POLICY. 41 October/November 2018 unmanned systems inside C ollisions with birds can threaten the integrity of airplanes and the safety of their passengers. Now scientists are developing ways to use drones to herd f locks of birds away from airports, potentially helping prevent dangerous bird strikes. 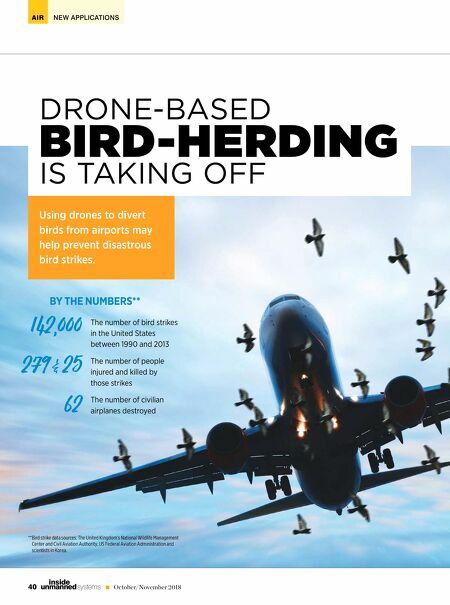 TOUGH TO FOOL Collisions that birds and other wildlife have with aircraft cause more than $1.2 billion in damage to the aviation industry annually worldwide. In the United States, 142,000 bird strikes destroyed 62 civilian airplanes, in- jured 279 people and killed 25 between 1990 and 2013. Similarly, in the United Kingdom, there were 1,835 confirmed bird strikes in 2016, or about eight for every 10,000 f lights, and Korean civil aircraft suffered more than 1,000 bird strikes between 2011 and 2016, ac- cording to experts. ** Airports and researchers have explored a variety of ways to reduce the risk of bird strikes on airfields. Such bird-scaring tech- niques include lasers, f lares, distress calls, loud noises from shotguns or cannons, in- f latable scarecrows, radio- controlled (RC) pla nes, dogs, birds of prey, and eliminating surrounding areas of crops that birds eat and hide in. However, "ac- cording to surveys by the International Bird Strike Committee, none of those systems work adequate- ly," said Soon-Jo Chung, an associate professor of aerospace at the California Institute of Technology and a research scien- tist at NASA's Jet Propulsion Laboratory in Pasadena, California. The problem is birds get used to most bird- scaring techniques, or they come back after a threat has gone, or these methods just scatter birds to different parts of the airfield, where they remain a threat. "Simply put, birds are too intelligent," Chung said. DRONES VERSUS BIRDS Chung has previously developed a variety of f lying robots, including the most advanced bat-winged robot developed yet, and a bird-like f lapping-wing robot that could autonomously land and perch. He and his colleagues began investigating ways to prevent bird strikes af- ter a f lock of Canadian geese knocked out both engines of US Airways f light 1549 short- ly after takeoff in 2009. This resulted in the "Miracle on the Hudson," where pilots Chesley "Sully" Sullenberger and Jeffrey Skiles suc- cessfully performed an emergency landing on the Hudson River. "The passengers on Flight 1549 were only saved because the pilots were so skilled," Chung said. The only proven last- ing way of preventing bird strikes is by using raptors such as falcons to scare away other birds, but this strateg y is not adequate on a wide scale. 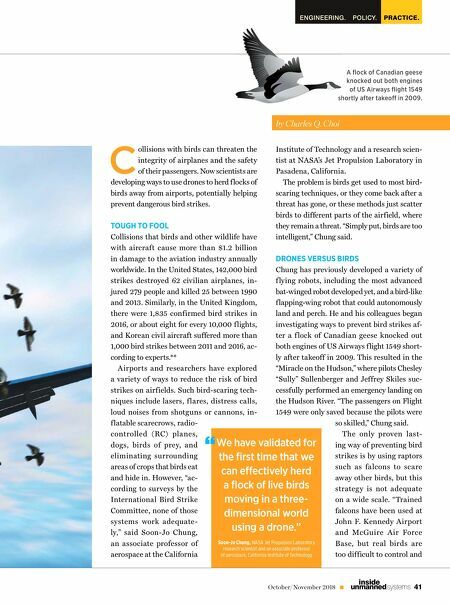 "Trained falcons have been used at John F. Kennedy Airport and McGuire A ir Force Base, but real birds are too difficult to control and by Charles Q. Choi We have validated for the first time that we can eectively herd a flock of live birds moving in a three- dimensional world using a drone." " Soon-Jo Chung, NASA Jet Propulsion Laboratory research scientist and an associate professor of aerospace, California Institute of Technology A flock of Canadian geese knocked out both engines of US Airways flight 1549 shortly after takeo in 2009.